FILE INFO: Pattern is 9 pages long (the nitty gritty is over 4 pages), 3.1MB. Pattern is charted. 2 charts are provided, one pre-colored and one with symbols you can color in yourself. 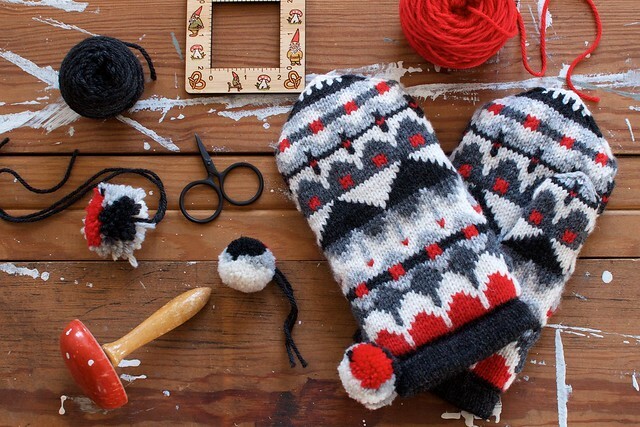 These mittens remind me of modern Scandinavian design and peaks and valleys, so why not name them after a beautiful Scandinavian mountain range? Stranded worsted weight creates a toasty warm mitten. Choose neutrals with a pop of color or go wild with a rainbow. 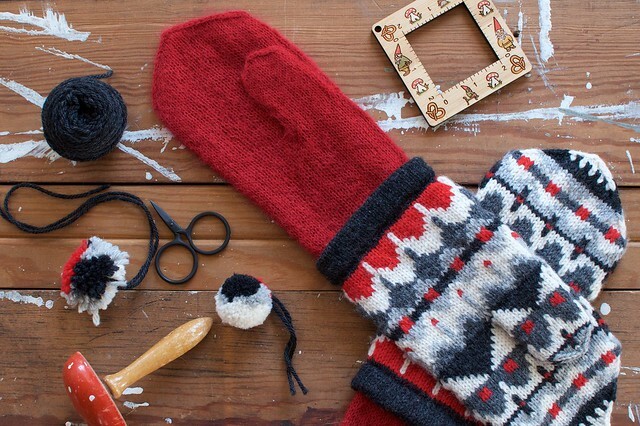 These are easy to knit, with two colors per round, but look impressive! ACTUAL MEASUREMENT: 8.25” (9”, 9.75”) [21cm (23cm, 25.5cm)] circumference, and 10.5” (11.5”, 12.5”) [26.75cm (29.25cm, 31.75cm)] long. OUTER MITTEN GAUGE: 28 (26, 24) stitches and 28 (26, 24) rows = 4” [10cm] in colorwork pattern. Finished mitten size is determined by gauge/needle. LINING GAUGE: 32 (30, 28) stitches = 4” [10cm]. NOTIONS: stitch marker, smooth waste yarn for holding stitches, darning needle, optional Clover 35mm pom pom maker. YARN: Outer Mitten – Cascade 220, 220 yards [201 meters]/100g [3.5oz]; 50g each of 5 colors. Lining – Frog Tree Alpaca Brushed Suri, 218 yards [199 meters]/50g [1.76oz]; 1 skein. REQUIRED KNOWLEDGE: Knitting in the round, long-tail cast-on, increasing and decreasing, 2 color knitting.